Can I automatically map a network drive when booting up into Active@ Boot Disk for Windows? The Boot Disk Creator will not recognize the USB memory stick plugged into the system. I would like to create a custom bootable image that automatically includes settings such as sending a certificate by email, including our logo in the certificate and other options. It seems I can do this in the installed version using the KillDisk.ini file. How can I do something similar for a CD created using Boot Disk Creator? Why does the computer reboot after 72 hours after running anything from within Boot Disk? New! Why won't my WMI based scripts work in Active@ Boot Disk when they run just fine in normal windows boots? To map a drive, you would need to create a CMD script file and use the Windows "Net Use" command to map a drive, then add it into the scripts section of the Boot Disk Creator. Usage and Sample of the NET USE command. You can try plugging in the memory/flash stick into another port and try again. However some brands (such as new MicroCenter) may not be recognized. Please try a different brand of USB stick. A generic or no-name brand works best. Create INI file having all required settings (certificate, email, paths, etc…). 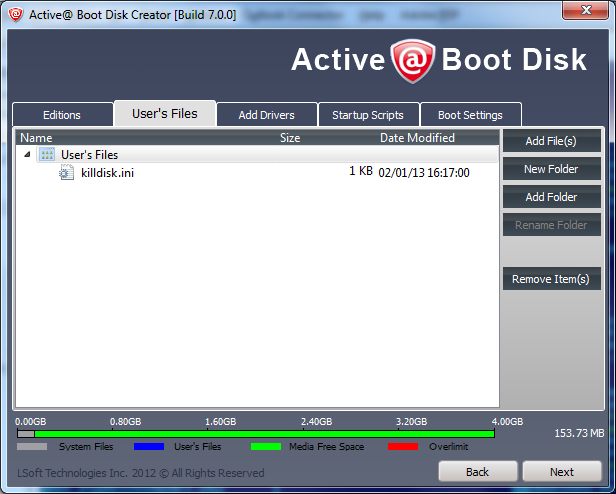 Use Active@ KillDisk to insert your settings and use the killdisk.ini file found in the program folder. Add the INI file to User's Files folder in Boot Disk Creator. Create a script to be launched on Boot Disk startup. This script runs KillDisk with the required command line parameters. Example: killd.cmd (assumes that D: drive is CD-ROM or USB flash) killdisk.exe -ip="D:\user_files"
Add the script file to Startup Scripts in the Boot Disk Creator. Turn OFF auto-start for Default Application in the Boot Settings section of the Boot Disk Creator. Turn ON Network (to be initialized on startup) in the Network tab of the Boot Settings section. Finalize the process by creating the bootable CD/DVD or USB and boot from it. How to load Active@ Boot Disk over the network via PXE environment? New! There are several steps required, configuring WinPE WIM, Boot Manager and PXE Server . For the configuration steps, let's assume that inserted Active@ Boot Disk has a D: letter in our configuration environment. We are using a WinPE environment that is booted into via PXE from a Windows Deployment Server. I am wondering if there is a way for us to copy registry information and files into the WIM file that we boot from so the applications are already installed and registered? Or will I need to script the installation and registration to occur each time we boot into WinPE? New! Windows PE reboots after 72 hours of continuous running. This is by design and can not be changed. Why won't my WMI based scripts work in Active@ Boot Disk when they run just fine in normal windows boots? 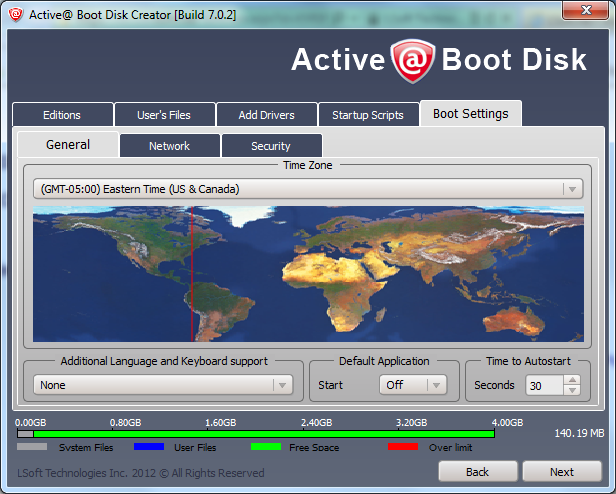 Active@ Boot Disk uses a WinPE environment to boot from and use as an operating system. This environment currently does not support all WMI commands, so you are using commands that WinPE itself does not support.